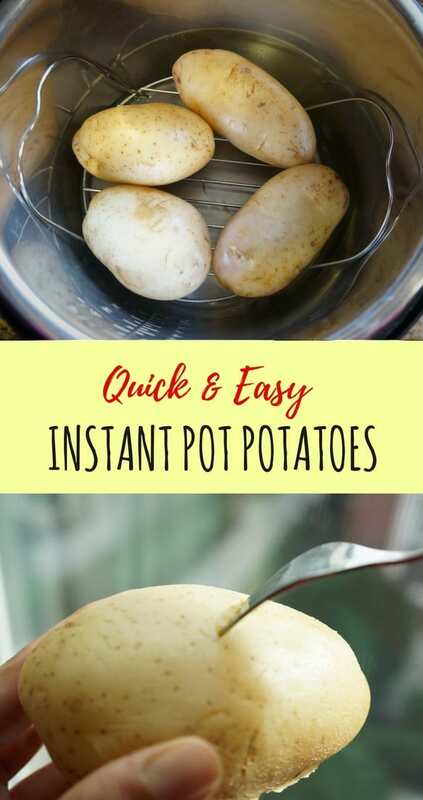 Home » Recipes » Instant Pot Cooking Basics » How to Boil Potatoes in Instant Pot? How to Boil or Steam Potatoes in the Instant Pot? This is part of the Instant Pot Cooking Basics series. Potatoes are perfect to steam in a pressure cooker, and it takes less an 30 minutes to get perfectly cooked potatoes. I use boiled potatoes in many dishes, such as potato peas curry, spiced mashed potatoes. I had always boiled potatoes in my stovetop pressure cooker, however it did need some monitoring. With the instant pot, just set the time and do a natural pressure release, while I can do other chores. Mumbai Vada Pav which is the popular Indian style burger. Savory Potato Puffs – This is very similar to the paneer puffs I have shared before. 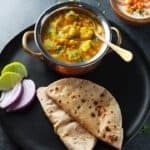 Just use boiled potatoes in place of paneer. How to Steam Potatoes in the Instant Pot? It is as easy as it gets. Just place the potatoes on a trivet. Add some water to the pot. Hit the Steam button. Adjust the time based on the size of the potatoes. It usually takes between 8 to 15 minutes depending on size of potatoes. For potatoes about 7 oz in weight, I steamed for 10 minutes. If potatoes are about 9 oz, then steam for 12 minutes. You get the idea! Can I steam potatoes without a trivet? If you want to boil potatoes while cooking something else in the main pot, then I suggest to use the mode needed for what you are cooking in the main pot. The Steam function works best when food is being steamed on a trivet. It increases the temperature inside the pot very fast, as it does not expect to have any food directly in contact with the bottom of the pot. How to steam small baby potatoes in the instant pot? For baby potatoes, I prefer to use a steamer basket. Add water to the instant pot steel insert. 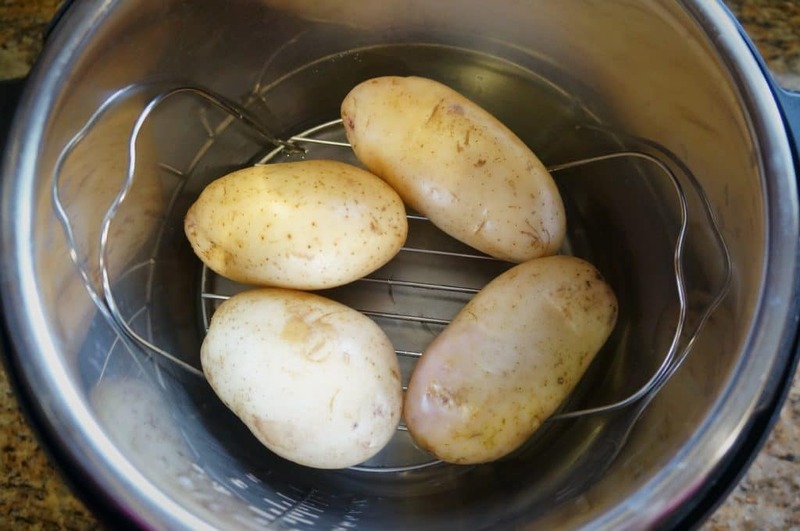 Place the steamer basket with baby potatoes in the instant pot insert. Pressure cook at high pressure for 5 minutes, then let the pressure release naturally. Check my detailed post about Steamed Baby Potatoes in the Instant Pot and if you want to directly make seasoned potatoes, check out these Spicy Bombay Potatoes..yum! How to steam diced potatoes in the instant pot? For diced russet potatoes about 1 inch in size, pressure cook for 3 minutes when using a steamer basket. If you are cooking them in the main pot, just 1 minute on pressure cook mode will be enough. Try these easy steamed potatoes and don’t forget to share how you used them! 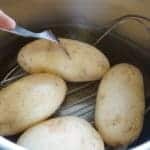 Quick and easy way to steam or boil potatoes in the pressure cooker. Clean potatoes with water. 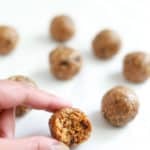 Add 1 cup water in the instant pot steel insert. Place trivet and place potatoes on top of the trivet. Close lid with vent in sealing position. Pressure cook on Steam mode at high pressure for 10 mins. When the instant pot beeps, let the pressure release naturally. If in a hurry, you can release pressure 10 minutes after the beep. 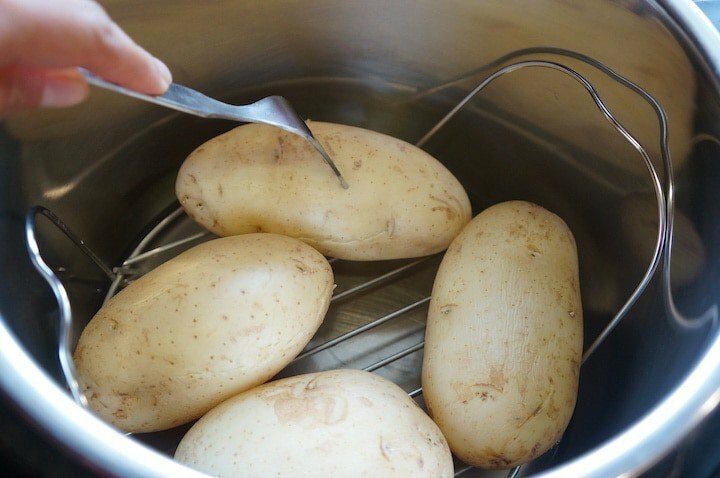 Remove the potatoes from the instant pot to stop additional cooking. Adjust time between 8-15 mins depending on size of potatoes. For example, if the potatoes are about 9 oz each, then steam for 12 mins. The cooking time remains the same even if you increase or decrease the quantity of potatoes, however the size of the potatoes affects the cooking time as mentioned in previous note. Which potatoes work best for you for boiling? Russet? For indian recipes like potato pattice or sabudana wadas I have noticed that they never come out perfect. Hey Zeel – I always use russet potatoes for indian cooking. 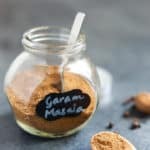 They the the ones commonly used in India for all cooking. 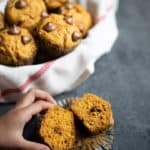 You can try to cook them a little more if they don’t feel soft enough for snack recipes where you are mixing with other ingredients. Here in US, I like to use the baby potatoes too, but typically not for the snack recipes where without skin is preferred. Can I peel the potatoes and them steam them? I need to make mashed potatoes. Hello Linda – Yes, you can peel and steam the potatoes in the instant pot. Hope you enjoy the mashed potatoes! I just boiled potatoes in the instant pot. I used two two potatoes and steamed them for 11 min. Natural release for 25 min.. They came out looking great. Do you know how long I have to wait to peel them? 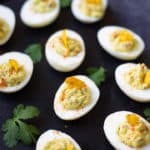 I want to make potato salad. Hey Patti – Glad to hear the potatoes turned steamed well. Usually there is not set time to wait, however I wait for when they are cool enough to handle. IF I am in a hurry, I also put them in cold water to stop the cooking and cool them quickly. Hope you enjoyed the potato salad. Thank you soooooo much. This formula worked perfect. My potatoes were smaller in weight so I adjusted time as indicated. It’s the start of summer and I was not looking forward to a hot kitchen from boiling potatoes. This is great!!! Hey Karen – Glad the potatoes cooked perfectly for you. Thank you for sharing back your experience! Hi, Do you leave the value in sealing mode or venting mode? 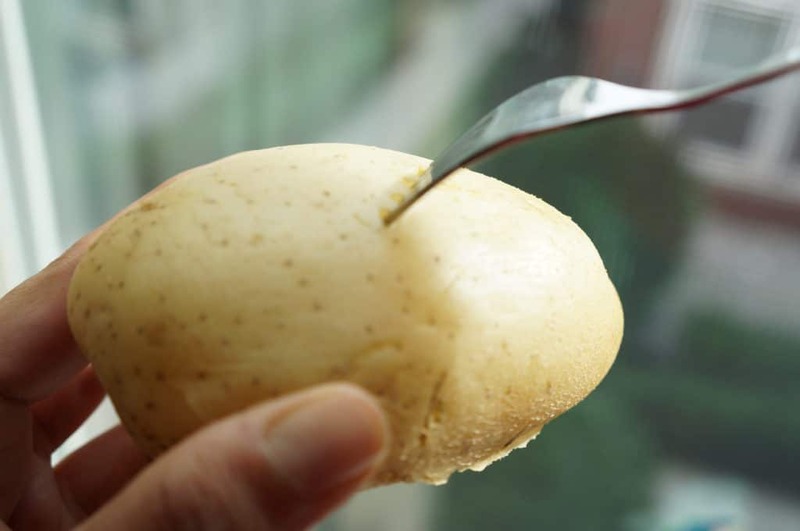 Hey Jyothsna – Valve would be in sealing mode to boil potatoes. Hope the the potatoes are perfectly boiled! Does the number of potatoes affect the cook time or amount of water needed? I’m wanting to cook 10-12 potatoes. I tried to boil my potatoes using this method in my steel steamer basket which has legs to raise it above the water. My potatoes were smaller, so I used the “Steam” mode on high pressure for 8 minutes, and did a 10 min quick pressure release. I noticed that my Instant pot did not come to pressure at all, though my potatoes ended up cooking well. Do you know why this may have happened? I added about 2 cups of water under my steamer basket. Was that too much water? Hey Dhanya – Two cups of water is enough liquid for the instant pot should come to pressure. I wonder there may be another issue – check if the pressure valve was in sealing mode and sealing ring was set properly. Sometimes when the sealing ring is hot and you are using it again it does not fit properly. In this case, you can place it in the freezer for few minutes and use again. Hope that helps!